I talked to Steve at Zoologix this week. Zoologix is the only place we have found to date that has a PCR test that actually detects the strain of trichomonas that sugar gliders have. They create PCR tests that they use. They seem to be on the cutting edge in this field. We got to discussing how they are developed. Steve told me that they have to know the strain of whatever protozoa or pathogen they are trying to make a test for in order to make the test. They use a commercial lab to learn the strains rather than doing it themselves. SO, I asked him if he could take a positive test result from 3 1/2 months ago from my glider and send it to the commercial lab to find out the strain? He said ,'yes'. I should have the results back by the end of next week. I only sent one sample for now as each costs $100. I hope it's another step toward learning more about the trich that has begun to pop up in our glider community. That will be nice to know the specific strain. I got the results from Steve at Zoologix regarding the DNA sequencing of the positive sample I asked them to do. The results state this: "Followup sequencing: 1203220127 amplicon sequence confirmed as Simplicimonas spp. � a recently-characterized group of organisms closely related to Tritrichomonas spp." It is my understanding that these organisms were named as recently as 2010. There doesn't seem to be much information regarding them that is available to the layman. I do know that the DNA seems to be closely enough related to some other organisms that it comes up as 'positive' on tests for those organisms. I have done my best to be helpful and transparent regarding things that I have found. I have spent thousands of dollars on testing when I didn't have sick gliders and have openly shared information and tried to brainstorm to figure what our gliders may have how these organisms may affect them. 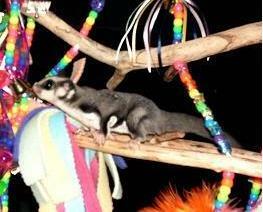 I had some joey losses and I had one sick glider, Grace who we believe caused issues for 2 of her cagemates. After changing my diet I have had no more joey issues whatsoever. I never had 'ick' joeys in my home. I did testing to be proactive yet, I have been told that I have "unresolved issues" by one person and I now understand that people have been talking behind my back accusing me of having a "google degree". I am not sure how I will 'resolve' issues that appear to have been caused by bad diet? I do not care to deal with people who feel this way about my animals and my facility. At this point, I will not speculate nor will I comment on anything regarding other gliders. I have shared my test results and I wish everyone the very best in caring for their animals. Tracy, from my perspective, you have been transparent, and proactive and very forth coming with the information. What I see is others who want to think they have all the answers or that only their vets know what they are doing or simply don't want to share any of the "spot light" what so ever. It's sad but for some, that is simply them. Don't change your ways because of other people. Change only because YOU feel the need to change. I agree with Dancing--you have done great- dont change. I say the haters are just sad people on many levels. I applaud you for doing what you have done. You sure didn't have to share any of the information you learned, nor did you have to go to the expense of having the DNA testing done. Don't let what other people say get to you. You know in your heart what you have gone through, what you have done about it, and further what you have voluntarily shared with the glider community. No one else is in your house to judge you.